Local hake, and the best of what the New England farmers have to offer. With brown butter, and salt and vinegar chips. 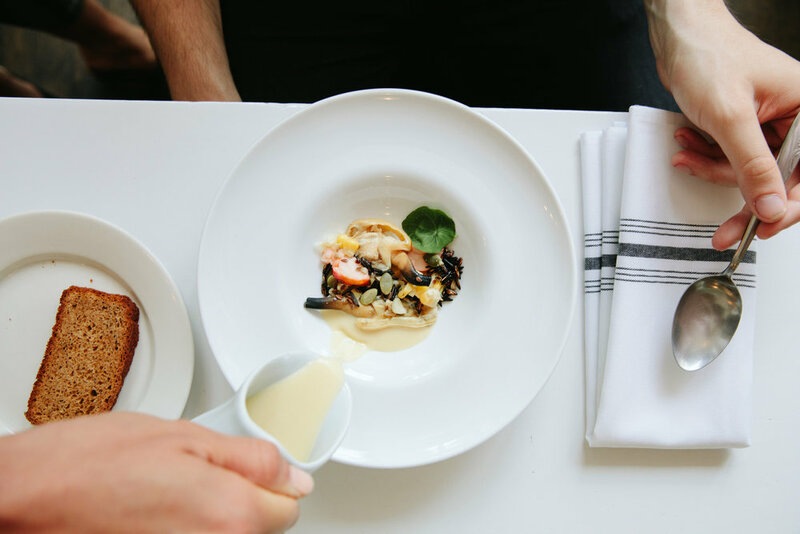 "Juliet has the ambition and skill of a destination restaurant"
Corn and lobster chowder, plus steamers. Dinner reservations at Juliet are booked as a pre paid ticket for prix fixe style menus available in three or five courses that change every six to eight weeks with a few extras along the way for holidays. These menus are full productions celebrating some of our favorite things. They represent a period of research, practice, and iteration and the cuisine and service is presented alongside original prose and poetry as well as art and dynamic design. The experience doesn't stop at the food, the entirety of Juliet is an open stage and everything is on display. We can only accommodate about 30 guests each evening, we are excited to perform for you. As dinner fills up quickly, we also serve an a la carte dinner menu on a walk in only basis, at six seats overlooking the open kitchen. This is a more casual menu, most of the items are fit for sharing alongside some great wine with a front row seat of the show. Or if you are curious about what might be coming next, here is an archive of all of our previous work. Want them all? Season Tickets are available in the Gift Shop, at a 10% discount plus a number of additional benefits (like guaranteed seating). PREFER TO DINE A LA CARTE? No problem. We do that too. But it's walk ins only and comes with a front row seat overlooking the kitchen. See that menu. Yes. Same place, different time. Different look. See Juliet Cafe.